What: Push-in ceremony for new fire engine. Where: Minturn’s Eagle River Fire Protection District station. When: 4 p.m. Wednesday, Aug. 1. More information: The push-in ceremony will be followed by station tours. The Minturn station is located at 195 Pine St.
MINTURN — Local firefighters will help keep a tradition alive when they christen a new fire truck with a push-in ceremony. 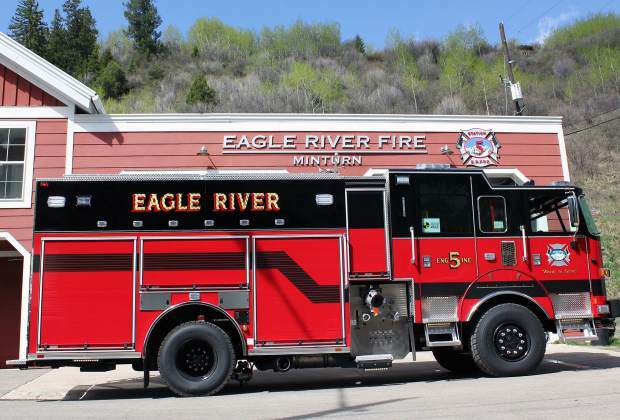 The Eagle River Fire Protection District is hosting the push-in ceremony at 4 p.m. Wednesday, Aug. 1, at its Minturn station, located at 195 Pine St.. The push-in tradition has been part of firefighting since the early days of hand-drawn fire engines, ladder wagons, hose carts and others. Those had to be pushed back into the station by hand, said Tracy LeClair, public information director for the fire district. The horse-drawn steam engines that followed could be backed up by the engineers, but it was difficult to align the steam connections on the engine with those in the station, so the horses were disconnected and the steamers were also often pushed back into the station by hand, as well, LeClair explained. “When motorized engines went into service, backing in by hand was no longer necessary, but the tradition of pushing new engines into the station by hand continues as a nod to the rich history of the fire service,” LeClair said. And that’s why the Eagle River Fire Protection District is inviting the public to help firefighters in the ceremony, followed by engine tours and cake. Engine 103 is a Pierce Arrow XT PUC custom 4-by-4 pumper and weighs in at a hefty 48,500 pounds. It was outfitted with additional technical rescue equipment, including more ropes and stabilization tools for vehicle extrication. It also has a booster line for wildland firefighting, in addition to the traditional 500 gallon water tank, 1500 gallon per minute pump and Husky 3 foam system.